Easy to swallow mini capsules, providing a high dosage omega-3 supplement with exceptional quality, low price point and made from a highly sustainable source. 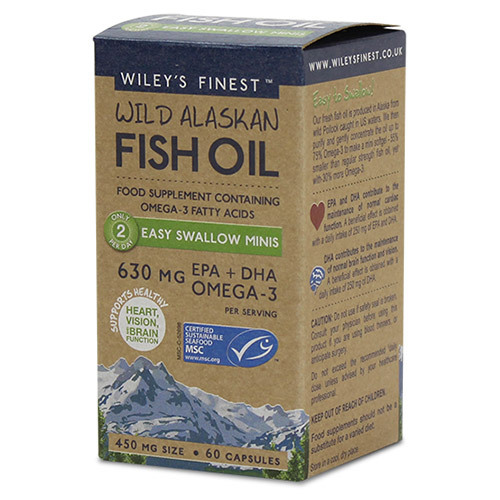 Wiley`s Finest fresh fish oil is produced in Alaska from wild Pollock caught in US waters. The oil is then purified and gently concentrated up to 75% Omega-3 to make a mini softgel - 55% smaller than regular strength fish oil, yet with 30% more Omega-3. 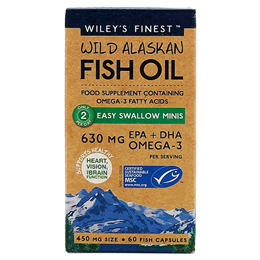 The Wiley family wholeheartedly believes in the benefits of Omega-3 and are passionate about spreading the message of good health through Omega-3’s EPA & DHA generated from fish oils. Concentrated Fish Oil Omega-3 Ethyl Esters, Capsule Shell (gelling agent: Gelatin, humectant: Glycerin, Purified Water), antioxidant (Natural Mixed Tocopherols [Natural Vitamin E]). As a food supplement, take 2 capsules daily with food. Do not exceed the recommended daily dose unless advised by a healthcare professional. Consult your physician before using this product if you are using blood thinners, or anticipate surgery. Below are reviews of Wiley`s Finest Wild Alaskan Fish Oil - 60 Capsules by bodykind customers. If you have tried this product we'd love to hear what you think so please leave a review.